Heat the oil in a medium soup pot over medium high heat, and cook the onion and fennel until soft. Add a big pinch of sea salt, and stir in the carrots, ginger, and ground spices. Cook for 3-4 minutes to intensify the flavor of the spices. Add the vegetable broth and bring to a boil over medium high heat. Reduce to simmer and cook 30 minutes. Remove from the heat. Using an immersion blender, puree the soup in the pot. Stir in the orange juice and lemon juice. Season to taste with salt and pepper or additional citrus. Preheat the oven to 425 degrees. Toss the butternut squash with the coconut or olive oil, sprinkle with sea salt, and roast for about 30 minutes, until the squash begins to brown at the edges. Meanwhile, in a small pot, combine the farro and the vegetable stock. Add a pinch of salt if the vegetable stock does not have any. Bring to a boil, reduce heat to a medium low and cook about 20 minutes, until al dente. Meanwhile, prepare the dressing. Drain the farro if necessary and toss with the dressing in a shallow bowl. Fold in the roasted butternut squash and the chopped parsley. 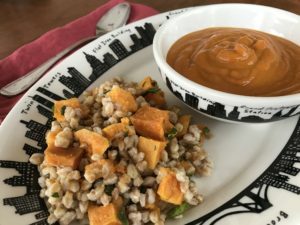 Allow the combined squash and farro to sit for at least 45 minutes so the flavors can build together. Serve at room temperature or cold.